I have to say, although the device itself is supposed to only weigh around 800g the box was pretty heavy. But this is because the box’ material is thick and very sturdy. 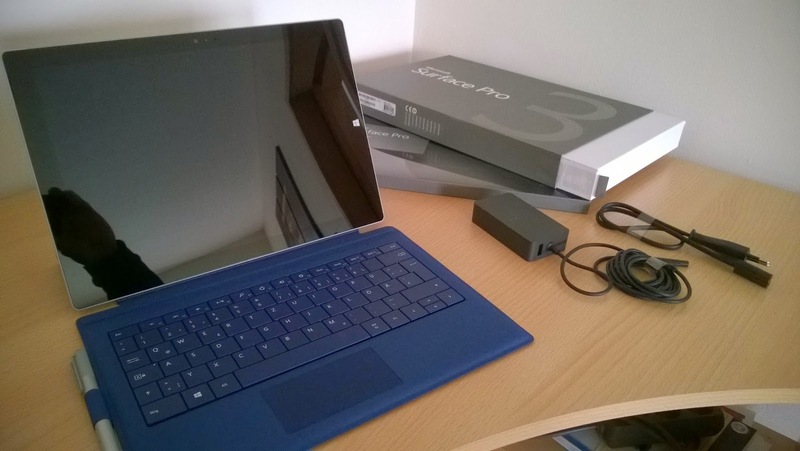 The Surface Pro 3 itself weighs as advertised. As I have written and measured in a previous post it’s comparable to an iPad 3 or 4 with the leather smart cover attached. 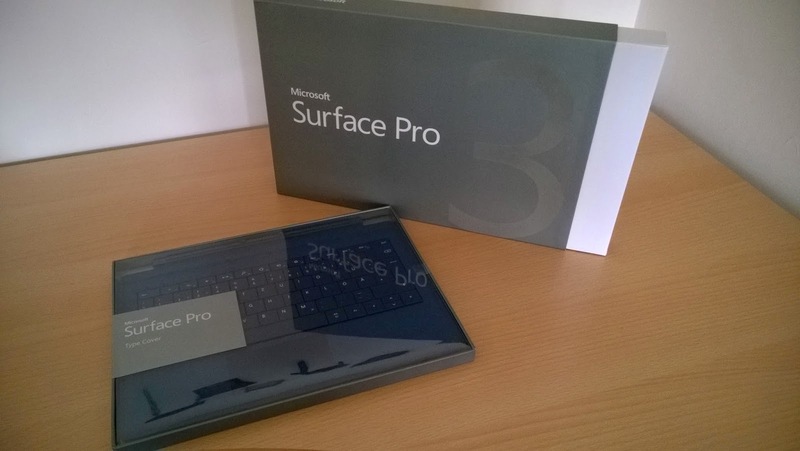 Of course, if you add the type cover to the Surface, the comparison is moot. In contrast to a typical Ultrabook this combination still wins. So, how is it? First of all, I think I may have experienced a stupid firmware bug which leads to the device not turning on initially (you can read more about that here). After doing the power button + volume up button trick (and attaching the cover, for whatever reason) it finally booted. Setup went pretty fast. I logged in with my Microsoft account and Windows 8.1 basically configured the most important things itself. As is the case with every new Windows PC, you have to install a bunch of updates immediately after turning it on and the Surface Pro 3 is no exception. Although everything went without a glitch I sometimes wondered if the device wouldn’t just shut itself down. I’m pretty sure I’ve experienced the full fan speed experience. Windows updates use a lot of CPU power and in a chassis as small as that of the Surface Pro 3 it can get pretty hot and it did get pretty hot. If the CPU is taxed with about 30% for a longer period of time, then the fan kicks in. Which is the case when installing updates. After everything was up-to-date and the performance heavy things had been finished (of course in parallel; I installed Office while doing updates) the Surface was silent most of the time. Watching a video in the Channel 9 app barely caused the CPU to warm up. The same is true for working with Word. While I’m typing this no fan is running and there’s almost no heat generated. Reading a comic with the Comixology app and installing Visual Studio Express from the internet didn’t result in spinning up the fan either. The type cover works surprisingly well. It took a little bit getting used to because there is very little key travel, but after having now typed a maximum of around 1000 words I feel pretty comfortable. The often touted “lapability” is true for me as well. I’m currently sitting on my couch with the Surface on my lap. I am 175cm “tall” and still have some room until the device falls of the cliff that is my knees. Granted, I have a lot of space in front of me and can sit very comfy. If this is true for a more cramped environment, like the bus or train, we’ll never know. My use case is mostly at home and maybe take it to work for lunch breaks (or even replacing pen and paper there as well). So far I’m happy that I have bought this little, powerful machine. I hope it will serve me as well as the iPad did, only with much more capability. I’m really looking forward using the stylus and OneNote to replace pen and paper. From what I have seen so far, OneNote is extremely powerful once you master it. And having the nice integration of the pen and the application (clicking the top button on the pen immediately starts OneNote) really makes the transition much easier. Just as a side note: The loop that holds the stylus is very tight. Since it is only attached with a little adhesive strip I already managed to rip it off once. Be careful if you’re using this as well.